Goodwill of Central Indiana has been a partner of ours for nearly 15 years. While most people recognize Goodwill as a place to shop or donate gently used goods, many don’t know that Goodwill has much more to offer. Education is one of Goodwill’s most important initiatives. At their Excel Center, Goodwill helps adults earn their high school diploma. At Indianapolis Metropolitan High School, they provide career and college preparedness for an underprivileged population of students. In addition to their focus on education and employment, Goodwill is committed to helping first-time parents succeed through their Nurse-Family Partnership. Starting in 2011, this program now serves more than 1,000 families in Central Indiana by pairing first-time pregnant mothers with a registered nurse. The nurse then provides ongoing home visits and support for these mothers in the most critical years of their child’s development. Our latest project with Goodwill is a 16,500-sq. ft. renovation of their Nurse-Family Partnership offices on the west side of Indianapolis. In this office space, Goodwill’s employees need more mobility in their administrative environment than what they’ve had in the past. With that in mind, we designed a space that supports that kind of openness and flexibility. With nurses flowing in and out of the building all day long, and some employees only working in the office a week or two out of the year, the need for a traditional office layout simply isn’t necessary. 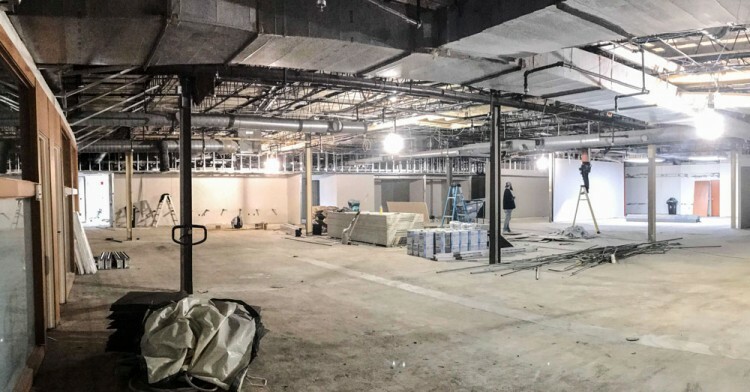 Instead, an open workspace with Goodwill-blue workstations, focus booths, private meeting rooms, and an interactive warzone will give the administrative building a new life. Opening the space will do more than just improve the aesthetic of the interior, it will encourage more collaboration and communication among coworkers. In addition to creating a more collaborative and mobile working environment, we’re giving the space a serious interior upgrade. Starting with the reception area at the entrance of the building, Goodwill’s message will resonate with visitors from the moment they walk through the front doors. Along with the blue and green color-scheme, new built-in benches will be installed in the reception area to make it feel more welcoming. A photo wall with hanging, interchangeable frames will greet visitors in the reception area, displaying familiar employee faces to show them who’s working in the office that day. And finally, a media wall will be displayed to inform visitors what’s going on in other areas, like the Excel Center and Indianapolis Metropolitan High School. Within the working office area, artwork will bring the walls to life. Blue accents on the walls and in the workspaces are consistent with the branded elements of the reception area, and carpet throughout the space will add movement to the large, open office. Our renovations are scheduled to be completed in May. Until then, we’re thrilled to be able to provide our services to an organization that means so much to the Central Indiana community.